I'm getting the exact same error. 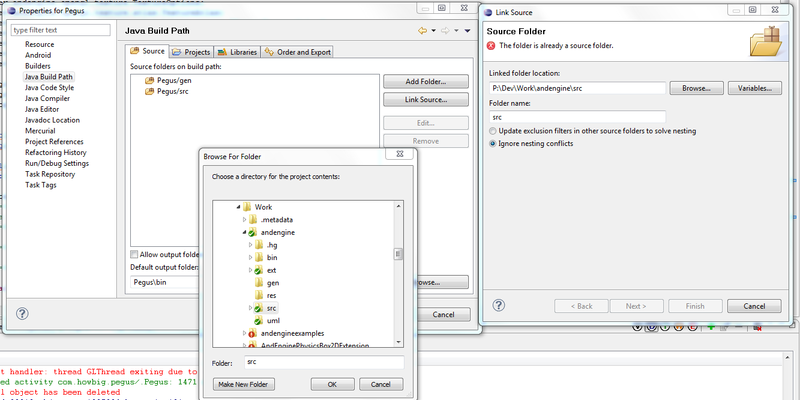 I cloned the andengine repo using hg in eclipse. I opened the Java build path for my project, clicked link source, browsed to the andengine project directory I just cloned and chose the src folder. Turns out you need to rename the folder to something other than src and then it works perfectly. OH!! Yeah, you need to rename it. Since it's importing a src folder from another project, it would think to just name that imported folder the same name that it is in the other project, (being "src"). Since your project already has a folder named "src", it won't let you name your imported folder "src" because you already have a folder named "src"
See in my example tutorial, I've renamed it "AndEngine_src" to distinguish between the two. So where it says "src" just rename it to "AndEngine_src"
Please rush me my portable walrus cleaning kit. Yes I am over 18 but my IQ isn't. AndEngineAugmentedRealityExtension] Android requires compiler compliance level 5.0 or 6.0. Found '1.4' instead. Please use Android Tools > Fix Project Properties. Android Tools->Fix Project Properties doesnt help. i added in each project the res folder manually, this error doesnt occure anymore, but the other does. Help me this is really annoying. What a mess. It's probably better to just point new people to an older branch. .299 is good for sure. select, download. everything will work. wait for entire site's worth of tutorials to be rewritten. Thanks RBG, 299 works perfect. Still so angry about this, was sitting till midnight. Deleted eclipse, configured everything new to figure out it still doesnt work. I should just switch to iphone mby its worth the money. **HOWEVER**, when I tried to do this with the box2d project it didn't work as this won't include the lib into the apk. Then I find "Now using related projects as Android library projects." actually means it literally, as shown in the attachment. Version 30x. I think it is 303. Just in case you get really tired of trying to find the newest version that actually works just be downloading the Mercury rep. Instead of having to fix the source stuff in what seems to be rather complicated ways. But thanks for this tutorials. Gives me a chance to figure out how to make the new method work one day.